Mumbai, August 14: Recently during the discussion on ‘No Confidence’ motion in Lok Sabha, Congress leader Rahul Gandhi cited allegation on Rafale Deal. The same day both the countries (France and India) from their parts clarified on the rubbish allegations which created unnecessary clouds of suspicion on the clear, transparent and straightforward deal. The Rafale deal with France which created numerous questions in minds on what is exactly ‘Rafale Deal’? What the deal contains? Is it beneficial for the country? And so on. The actual process began in 2007. The Defence Acquisition Council, headed by then Defence Minister A.K. Antony, approved the Request for Proposal to buy 126 aircraft in August 2007. Now, after Rafale won the contract, the Indian side and Dassault started negotiations in 2012 with the delivery of the aircraft to start in 2016. In 2015 PM Modi announced that India would be buying 36 French-manufactured Rafale fighter jets off-the-shelf from Dassault, the French aircraft builder, and integrator. In 2016, India confirmed the order of 36 Rafale jets in defence deal with France. Along with this, India rowed back from the commitment of the last UPA government to buy 126 Rafales. Why 36 Rafale planes and not 126? As the image of Rafale Deal gets a bit clear, the question in every common man’s mind would raise that for our country’s protection 126 jets would be very beneficial than merely 36. 126 jets that were ordered were kind of frames without any missiles or any weapons loaded. In other words, India would get only 126 frames for which only we have to hunt for weapons that would fit in the planes and also till the 126 aircraft would have delivered the technology used in the jets would be the older than the latest. The 126 jets which we would have got were also in no ‘ready to fly’ position. That means if there is an emergency period then the 126 would have proved to be non-beneficiary and standing in their sheds. With India getting 36 jets fully loaded with weapons, 75 - 80% of the jets India will imbibe will be in ‘ready to fly’ position. There is an international concept that a country shall have 75 – 80 % jets in ready to fly position. So this clears the deal up to 25% itself. With government discussing the accumulation of these air jets, Indian Air Force asserted that India needed minimum 2 squadrons (36 jets) for the sake of Eastern and Western parts’ for the country’s protection. Where is the tender of the deal? Congress leader Rahul Gandhi claiming another allegation questioned where is the tender of the deal? If this question is asked by a normal man of the country then it can be considered; but, a person sitting in Parliament for so many years doesn’t know that there is no tender system between any two or more governments’ deal? Only Ambanis has given the contract? It was made very clear initially that there is not only the Ambanis (Reliance Company) involved in the manufacturing process, there are 72 Indian companies who will be producing various parts need for the Jets’ production and that too they are directly linked with the French Company Dassault. 50 % manufacturing of Jets’ parts will be offset. In this process, neither the central govt has given an order to the companies directly nor will it be paid to them directly. It is the only and only the French govt which will be paid and it will be paying to Dassault and Dassault to the 72. The French Dassault Aviation would invest 100 million euros in India to make the components for the fighter jets and Falcon civilian aircraft. Now the deal is 50% clear. One of the best things these 72 companies indirectly are doing is completing PM Modi’s dream of ‘Make in India’. As we are going to produce several parts to be used in these jets, ultimately we are learning and experimenting technology in our country itself. It will also help us to come out of our deficiency that is to import every modern part. So isn’t that good that we are learning new technology, we are getting labour, and we would know our calibre? Why the official documents not been released? Once the government has made it clear about the deal, it's manufacturing, its cost, and its characteristics then why the oppositions want official documents to be released? To whom they want to show indirectly about India’s defence sector? There would be no point of a surprise if the official documents are released and also something has to be confidential. By now we have cleared 75% path of the deal! Why Rafale Jet and not HAL Tejas? The reason behind this is that Tejas is single-jet engine whereas Rafale is twin jet engine. A single jet engine cannot resist as much as Rafale can. Even a bird hit or an attack can damage the engine of Tejas and it might crash or the most valuables the pilot who is highly trained might fall prey to death or the enemies. Rafale can resist these attacks and also can enter the boundaries of enemy nations successfully. So which one is better the one who rounds the den or one who enters the den? Most important thing is that Tejas’s takeoff weight is 10000 kgs whereas Rafale is more than double to that of Tejas i.e. 25000 kg which can carry missiles like Brahmos. It is said that criticism leads to better governance. 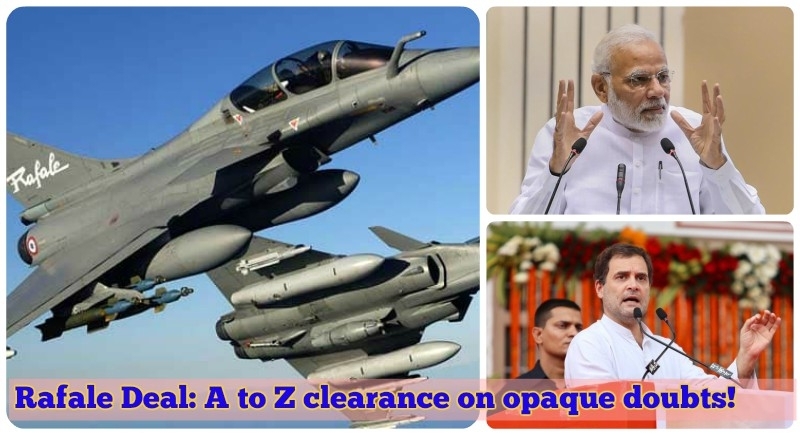 If thought positively the allegations put by the Congress Party is an opportunity to present the whole scenario of the Rafale deal. The foolishness of the oppositions by putting allegations paved the way to make our people free from this confusion. In a real sense, it is Independence from the confusion of Rafale Deal.